I am always on the look out for recipes for starters, as they set the tone for a dinner as it were. 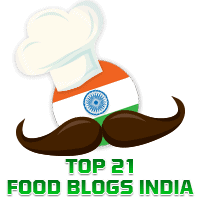 Some of the interesting starter recipes you will find elsewhere in this blog are Hara Tawa Paneer, Semolina Roast Potato, and Paneer Tikka Kathi Rolls. I recently came across this Indian Chinese starter which I have adapted from Crispy Chilli Baby Corn by Richa Sharma in Sify Bawarchi. I particularly liked that in this dish we shallow fry the baby corn and not deep fry it. As is common with dishes in Indian Chinese cuisine there are a large number of items in the Ingredients but I assure you the final result is well worth getting them all together. Spring Onion Whites, 1/3 cup. Spring Onion Greens, 1/4 cup. Tomato Sauce, 1 and 1/2 tbsp. Cut the baby corn into 1 " pieces, quarter the onions, and chop the spring onion whites and greens. Keep aside. Thinly slice the capsicum. Keep aside. Prepare the marinade by mixing the ingredients listed under "For The Marinade" (black pepper powder, ginger garlic paste, salt, corn flour and water) in a bowl. Heat 2 tbsp of oil in a thick-bottomed pan and when it gets hot add the marinated baby corn and shallow fry on medium flame till it turns golden brown on all sides. Keep aside.